Air Feeder, Stand Alone Air Feeders - THERM-O-TYPE Corp.
Air Feeder - THERM-O-TYPE manufactures two stand alone feeder models which have been designed for use with laser die cutters, UV/Aqueous coaters, curing ovens, etc.. Stand alone air feeders are available with two different speed control systems, and can be used with or without an alignment table. To provide maximum flexibility, feeder controls are ambidextrous. THERM-O-TYPE Feeders are available with two different types of speed control for two different speed ranges. 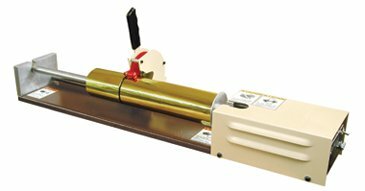 One control version is for applications requiring paper feeding at speeds ranging from 100 to 1,100 sheets per hour. Our air feeder uses an internal pulse generator with potentiometer to precisely time feed cycles. 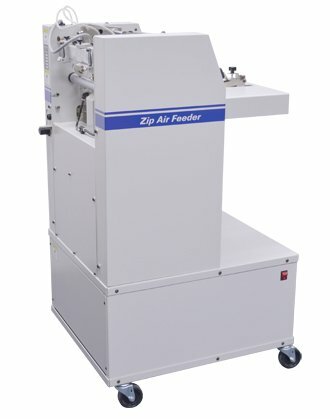 Laser die cutters are one example where the paper feed rate would fall within this range. The second control version is for applications requiring paper feeding at speeds ranging from 1,000 to 6,000 sheets per hour. THERM-O-TYPE feeders use a variable speed drive motor with potentiometer. UV/Aqueous coaters are one example where the paper feed rate would fall within this range. The Stand Alone Air Feeder can be purchased with or without an optional alignment table. 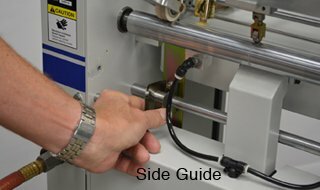 When the air feeder is used for UV coating, for example, a registration table is typically not needed. When the feeder is used with a laser die cutter, for example, a registration table is essential. Optional alignment tables feature precise side-to-side registration and skew adjustment. Stand Alone Air Feeder - THERM-O-TYPE Corp.